Is grime dead? Or has it 'just gone back underground'? Grime is already said to have died once in its not yet two-decade-long existence. And now some people have questioned whether it's slowly dying again. It might seem like grime has been everywhere over the past few years - with Skepta and Stormzy's achievements evidence of its crossover into the mainstream. But some fans have questioned whether it has a future, with different styles of music proving more popular right now. Grime's a genre "that's had to struggle", according to 18-year-old MC Yizzy. "It's been called 'underground music', it's been shunned as 'violent music', it's been labelled as just 'people with hoodies trying to spit lyrics about drugs and violence'." But despite being seemingly more successful than ever, grime has recently been knocked off its perch by more popular sounds. 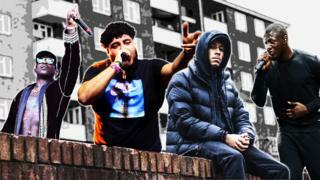 Drill music, with its slower trap beats, is having a moment. And whether it's being labelled Afrobeats, Afro-swing, or Afro-bashment, that's another genre of black music you'll have heard on the radio and on nights out. Producer Steel Banglez says the snare drum coming on the third beat, rather than the fourth, is what characterises it. Yizzy makes the case that grime will have its moment again. "Right now everyone's hooked on the Afro-bashment and the drill vibe, but just like grime was popping three or four years ago, phases come and go. "There's gonna be another grime phase. There will also be another Afro-bashment and drill phase. That's how it goes." But listen to Yizzy's music and you'll hear that's definitely not the case. The Lewisham artist, who was barely born when grime was emerging from east London council blocks, released an EP earlier this year with a very clear message. It's called SOS - Save Our Sound. A collaboration with some of the producers who helped to pioneer the grime sound, Yizzy says he felt his EP was needed to stop grime being "watered down". "There's a strong misinterpretation of grime music that the world has had for a while. "There are Afro-bashment and drill artists that are being called grime artists," he says, referencing articles that have labelled people like J Hus and Yxng Bane as grime musicians. "There's been so many ups and downs for grime and people want to water it down by mixing genres together? And just saying it's all the same thing? I feel like that's disgusting." Ask someone on the street what grime is and they'll probably be able to tell you who Stormzy and Skepta are. But it's been a while since Stormzy released his debut album. Kano and JME haven't released albums since 2016 and 2015 respectively. And Skepta's best-known recent tracks have been more Afrobeats and hip-hop than grime. London-born photographer Courtney Francis, who was on Stormzy's first tour and who documents the grime scene, says the Afro-swing sound is popular now for the same reason grime was a few years back. "Afrobeats sounds good. It's palatable. It's good on radio so it can be played in more places. That's what's making it grow right now. "It was the same thing with grime - certain artists were making more mainstream types of songs and therefore it was able to be played in many different places and be shared more." Courtney was big into American hip-hop before he heard people using slang like he used, in places he'd visited, on a cassette tape he was given at school as a teenager. It was a set from D Double E, recorded from an appearance on the Nasty Crew Show on pirate radio station Deja Vu the night before. "It was a sense of identity," Courtney says. "Ever since then I've been a grime kid." He thinks that the resurgence grime experienced a few years back, when the song German Whip by Meridian Dan sparked new interest in the dormant genre, has opened the door for the sounds proving popular today. "Grime had a boom, but then people changed. The music changes, people's appetites change, and it's gone on to Afrobeats and UK rap and drill now, and grime has gone back to the back burner." "But," he stresses, "only for the people who look for music in the commercial spaces." Yizzy's SOS was released in May and it's unlikely you'll hear it played on commercial radio - despite it containing many elements that were popular a few years ago. But subscribe to the right playlists, follow the right YouTube channels, and listen to the right radio shows, and you'll hear that grime is very much alive. "Those same artists, and new artists as well, are doing their thing right now. The only difference is that it's not in public spaces. It's no longer the backdrop for TV programmes and you're no longer hearing it on radio often. "But everywhere else where grime existed before, it's still there. "People are saying it's dead because it was commercialised and it was accessible for more of the country. You didn't have to search for grime. Grime was just there." And unlike some other genres which have faded into obscurity - in the public's eyes anyway - Courtney doesn't think grime will go that way. "I've been going to shows for many many years and the audiences are not dwindling," he says. "P Money is selling out shows all over Europe. That's not changing. He's been doing that for the last 10 years." "Grime isn't dead. It's just gone back underground."